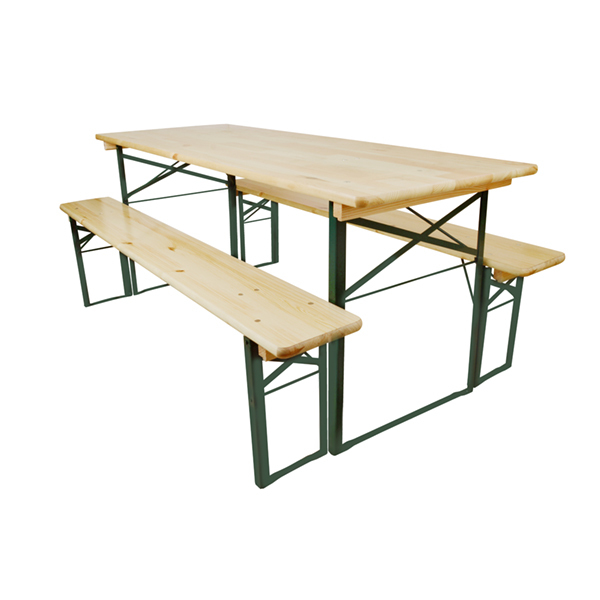 This range of folding tables and benches offers a practical seating solution for any indoor or outdoor event. Ideal for schools, universities, hotels, pubs, scouts, guides, sports and leisure centres. This range is constructed from high quality pine from well-managed European forests. The table and bench tops are treated with a hardwearing clear varnish making them ideal for indoor and outdoor use. The steel folding legs are sturdy and durable, while the secure latches make storing and transporting easy. Bottom cross bar on the legs helps prevent tables and benches from sinking into soil or grass. Commonly used in – Construction Yards, Scout Groups, Exhibition Furniture, Army Cadets, Adventure Centres, Racetracks, Football Clubs, Outdoor Furniture, Tables for Grass, Girl Guides, Movie Companies and Sports Groups.